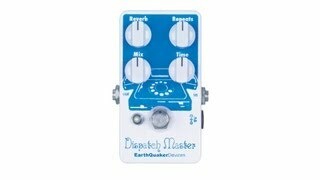 The Dispatch Master has grown to be one of the most popular and versatile delay/reverb pedals on the market. Loved for both its small size and lush sound, the Dispatch Master is capable of producing up to 1.5 seconds of delay time with near-infinite repeats and a cavernous reverb. The delay signal is clear and strong with no after effects or signal degradation and the repeats decay into a nice ambient swell with no oscillation. The reverb is MASSIVE and is sure to please those who love our Ghost Echo but want more modern depth and less artifacts. Both effects can be run separately or in unison. When using the reverb with no delay, the repeats control can be used to thicken up the reverb and give it more dimension. The Dispatch Master features a digital delay and reverb line with an all analog direct signal path and true bypass switching. A standard 9 volt DC power supply with a negative center 2.1mm barrel, no battery option. We do not recommend using this pedal on a daisy chain. Please use a a dedicated power supply or isolated output from a multiple tap power supply for best performance.